A campaign launched at the World Conference on Tobacco or Health in Cape Town, South Africa in March, is aimed at separating the tobacco industry from the vendors that make their dirty work possible, especially advertising agencies. Quit Big Tobacco is an initiative of Vital Strategies. 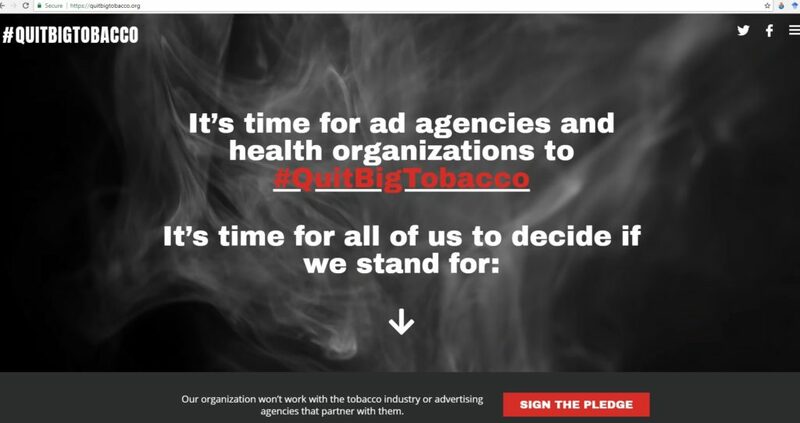 It is calling on non-profit organizations with health in their mission to pledge not to work with the tobacco industry and affiliated advertising agencies that aid and abet the industry’s effort to hook a new generation of tobacco users. To date, 85 organizations have pledged. Organisations can make a pledge here. The campaign launched with a website at QuitBigTobacco.org and a social media campaign, #QuitBigTobacco. The idea is to expose these affiliations and pressure marketing and advertising agencies to drop their relationships with the tobacco industry. Tobacco claims more than 7 million lives each year. The tobacco industry uses aggressive marketing to hook young people and turn them into life-long smokers; advertising is a culpable vector for the death and misery it causes. Some organisations and their ad agencies have decided not to work with the tobacco industry, but others continue to do so. Some ad agencies have tobacco industry clients while working with health organizations. For example, Marlboro’s global Don’t Be a Maybe campaign is the work of Leo Burnett, the same advertising agency behind recent ads for United Healthcare, a leading health insurance company who may be unaware of the situation. This is an unacceptable contradiction. Organizations with wellness at their core – hospitals, insurance companies, international nonprofits, sports companies, universities, and food and nutrition companies – have a win/win proposition at their fingertips. They can Quit Big Tobacco and make a clear statement about their organisational values, use the power of their purses to work against the tobacco epidemic, and pose no risk to their business operations or their missions. Vital Strategies is encouraging organisations that care about health to check that their current suppliers don’t work with the tobacco industry. If they don’t already have them, organisations might consider including a conflict of interest clause in standard vendor contracts to prevent their vendors from also working with tobacco companies. The Quit Big Tobacco campaign is also encouraging organisations to not accept funding from tobacco companies or the Philip Morris-funded Foundation for a Smoke Free World, in line with statements from the World Health Organisation, numerous universities and more recently the Polish government. It is also asking organisations such as promoters, not to allow tobacco sponsorship.